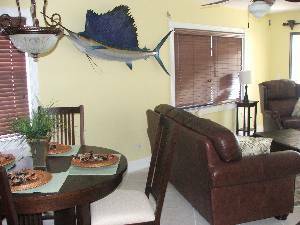 ''The Hemingway Hideaway''- Amazing Gulf Front Condo! This fully furnished, fifth floor, corner unit will absolutely take your breath away and is not your typical unit! 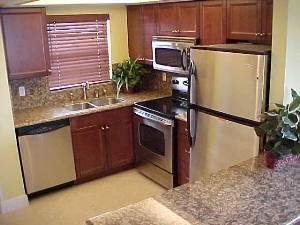 Our condominium has just been completely remodeled (10/2005) with brand new kitchen cabinets, stainless appliances, granite countertops in kitchen & bathrooms and tiled throughout. 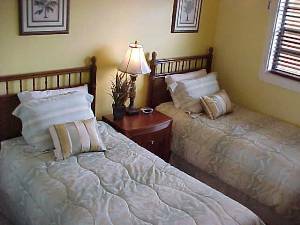 The unit is tastefully decorated and furnished with a "Hemingway" theme and instantly will make you feel relaxed and right at home. Be one of the first to stay in our paradise. 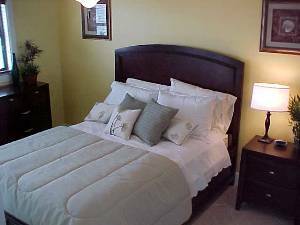 This direct Gulf front, corner unit adds two large "bonus" windows over looking the pristine palm tree lined beaches and inland waterways of Estero Island. 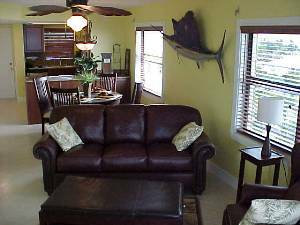 The living room and master bedroom open to your private screened balcony, providing you the inviting warm tropical gulf seabreeze and hosting your family to sunsets that are priceless!! 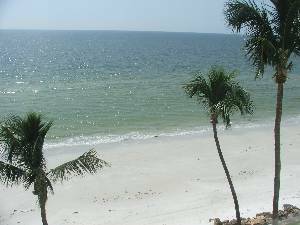 Imagine, every night falling asleep to the lullaby of the soothing sounds of gentle gulf of Mexico. You will never want to leave!! 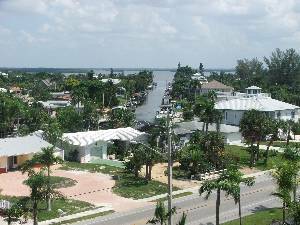 The Location is perfect, Mid-Island; walking distance to Publix(grocery) and a full service marina. Premium Outlets and upscale shopping centers, Regal Cinemas and restaurants galore are all minutes away. Relax and have fun & we hope you'll return again on your next vacation. 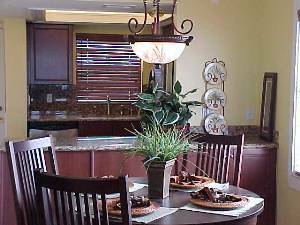 Gourmet Kitchen has view of inland waterway and Bay. Dining Area offers views of coastline and inland waterways. Twin beds convert to a King. Master Suite has private balcony access. The corner unit "bonus" windows allow a view from every angle. Lisa truly has a gem. We are lucky to have been able to spend a week in this beautiful place. We loved the high quality of everything (pots and pans right down to linens.) We can't say enough about how wonderful Smuggler's Cove is, the friendly staff and cleanliness. We stayed right at the site every day. We sunned, shelled, watched the dolphins, swam, played shuffleboard and enjoyed every moment of our vacation. We recommend this place to everyone! We had a great time relaxing at the "Hemmingway Hidaway". Your condo is beautiful! We loved your special touches like the Key Lime Pie. The view from the lanai is incredible- beautiful sunsets every night. I will miss hearing the sound of the waves & watching the pelicans right outside our window. It was better than staying at a Five star resort! We are looking forward to our next stay & will gladly recommend your "Hideaway" to our friends & family. Rates are based on Season & Availability. Monthly Rate is Available. Discounts for extended stays.